SEDGWICK COUNTY— Law enforcement authorities are investigating an aggravated robbery and asking the public for help to identify a suspect. Just after 11pm on Monday, police responded to an armed robbery call at the Walmart in the 10600 block of west 21st St. North in Wichita, according to officer Charley Davidson. 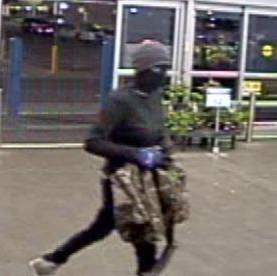 Upon arrival, officers contacted a 24-year-old male employee of Walmart who reported an unknown suspect entered the Walmart, brandished a knife, and demanded money from a 24-year-old female employee. The employee gave the suspect money and he fled out of the store on foot. There were no injuries reported. If anyone has any additional information on this robbery or the pictured suspect should call WPD Detectives at 316-268-4407 or Crime Stoppers at 316-267-2111.